The Kent School of Architecture entered this year’s AIA Student Charrette competition, held at the Roca Gallery in London. 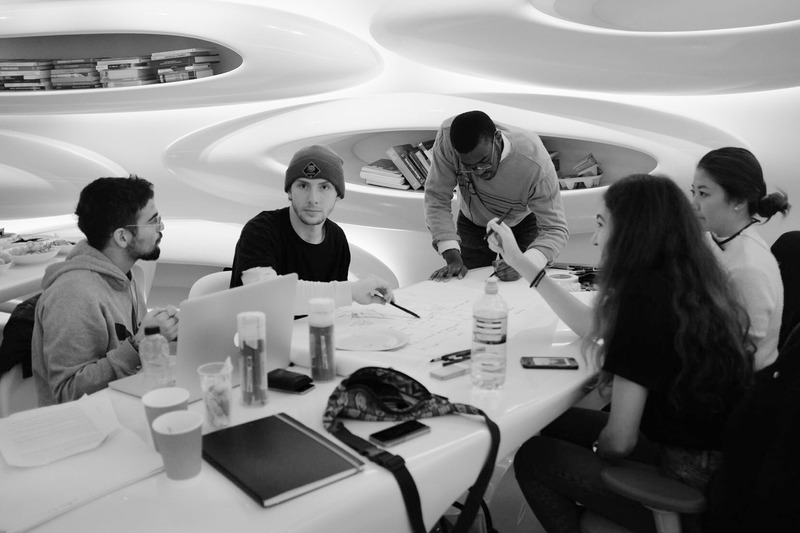 The team consisted of Edoardo Avellino, Ben Child, Ines Combalat, Kyle McGuinness, Jake Obichere and Christine Wong from Stage 3, BA (Hons) Architecture. The competition saw an array of participants from six universities and with the hope of continuing last year’s success as winners, a different challenge was posed. A daylong event, full of creativity, set the scene for a promising project. Set in Chelsea, at Lots Road Auction House, the brief for the day was split into two parts; i.e. to choose an object within the auction house, in order to describe its journey from the seller to the buyer, whilst imagining the process of the object in spatial and architectural form. At the Lots Road Auction House, a member of staff gave a short talk about the type of items that are sold and the process of auctioning itself. Particular points stood out to us as we began searching for a concept. 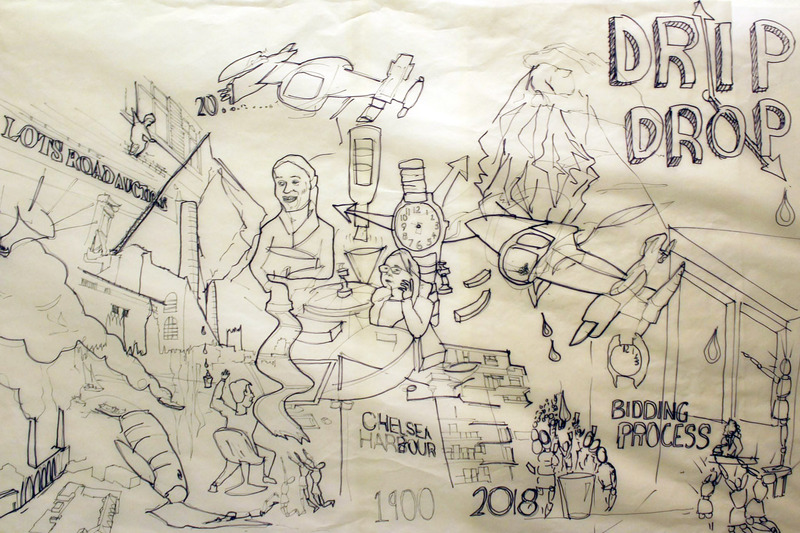 We were interested in how the bidding process had changed as technology and the world around had advanced, creating an auction house which worked mainly digitally now. This provoked us to speculate about the future of the auction house and how it may evolve as time goes on. Another interesting facet to the auction house is the bidding process itself and how people spend large amounts of money on items that they do not particularly want or need. This led us try to create a design that would match the drama of the bidding war in its architecture. 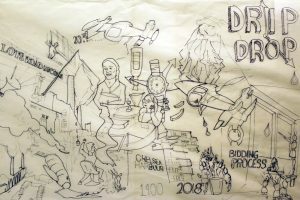 These influences manifested in an imagined dystopian world where water is scarce and one of its few sources are sheets of ice, imported from the arctic, to be bid on in the Lots Road Auction House. This highlights how an item that is currently taken for granted should have much more value than we attribute to it and plays with the idea of exaggerating the tension within the auction house by bidding on a rare necessity. In this scenario, we imagine that the Lots Road Auction House begins to sell ‘fresh, pure water from Arctic ice’ to its wealthy clientele, but as the conventional means of acquiring water becomes more restricted, demand increases for the Arctic-water. Due to this increased demand, the Lots Road Auction House moves in to the nearby power station and begins shipping in sheets of ice via the Thames. A shard of ice hangs between the two chimneys of the power station, slowly dripping in to a glass below it. The glass sits on a plinth in the centre of the power station, surrounded by hopeful bidders. Every time the ice drips in to the glass, a bid has to be made and when there is a drip with no bid, the most recent bidder lifts the glass from the plinth and drinks from it, replicating the hammer moment in the traditional auction house. As the bids are made, the new price is projected onto the side of the ice and the number of lights within the power station rise as the bid increases, elevating the tension of the process. From the outside, the city of London looks on as a level in the power station chimneys decreases, representing the ever-diminishing amounts of ice left in the Arctic. This in turn creates panic in the city, making its inhabitants flock to the power station to bid on water, once more increasing its value and adding to the intense nature of the bidding process. We portrayed this transformation of the Lots Road Auction House with various collages, models, sketches and drawings. Overall, the judges were looking for a more conventional version of the auction house rather than the surreal proposal we developed. 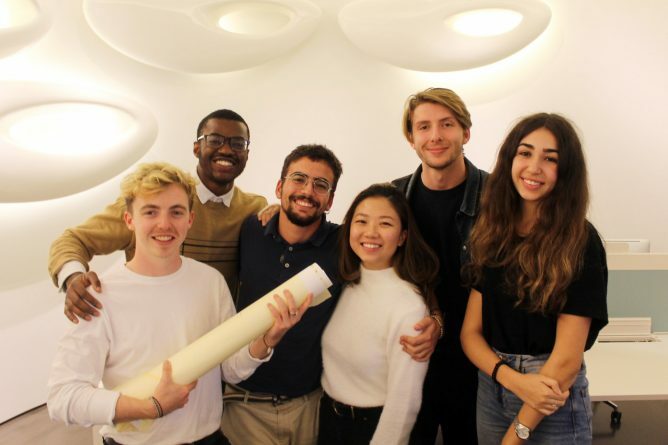 In the end, it was the students from the University of Westminster who succeeded to take this year’s title as winners of the AIA Student Charrette 2018. We learnt a lot during this CAD-free event, and it enabled us to be as creative as possible, learning how to respond to a brief through the methodologies of hand-drawing and model making. We would like to congratulate the winning team and thank Amrita Raja, our mentor for the day, ROCA and Laufen for supporting yet another successful event.